Memorial Day is truly the start of grilling season. As the weather is warming up, it’s time to heat up your barbeque as well. 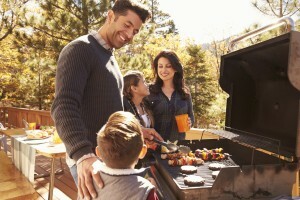 Burgers and hotdogs are always fan favorites but this weekend, serve up something unexpected at your cookout. We’ve got you covered with a few easy, delicious and new grilling recipes to try! Everyone loves pizza, but have you ever grilled it? Whether you make a big pizza or smaller personal pizza’s they will sure be a crowd pleaser! 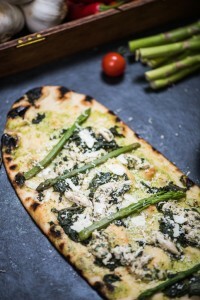 Add some gourmet ingredients you can turn your grill into a pizza oven! Heat up the grill to a medium high heat. Clean and lightly oil the hot grill. On a floured work surface stretch and roll your pizza dough into your desired size and shape. Brush one side with olive or herb oil and season with salt and pepper. Place dough directly on the heat source. Brush dough with oil and cook the underside until it is lightly charred and bubbles form (1-2 minutes). Top it with ricotta cheese, lemon zest and asparagus then cover the grill. Cook until cheese melts and toppings are heated through (2-5 minutes). Drizzle with herb oil before serving. Grilling corn on the cob is a summer staple, but if you want to spice up your side dish make Mexican style street corn instead! Mix together mayonnaise, chili powder, garlic salt and black pepper. 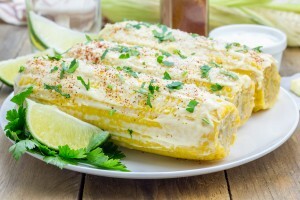 Remove corn from grill and brush with the mayonnaise mixture. Squeeze lime quarters over corn and serve. By grilling vegetables, so much flavor is added to them. 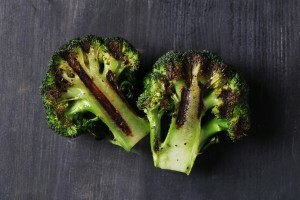 One vegetable that you may have not tried grilling before is broccoli, but you should give it a go! Here is an easy recipe that will infuse so much flavor into your broccoli. Add broccoli to a large bowl. Combine lemon juice, oil, salt and pepper. Cover broccoli and toss to coat. Let stand for 30 minutes. Toss broccoli then drain marinade. Using long tongs, prepare grill for indirect heat using a drip pan. Place broccoli over drip pan and grill, cover and heat over medium for (8 to 10 minutes). If desired garnish with parmesan cheese. Looking for a fresh and light dessert that will make you feel like it’s finally summer time? 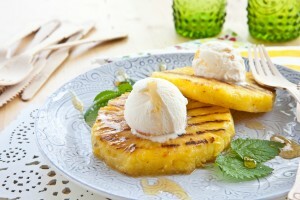 Here is must try tropical grilled dessert! In a bowl toss pineapple with honey and cayenne. Grill until light brown grill marks appear (10 to 15 minutes) turning once. Serve pineapple with sorbet and garnish with mint.